The Price of Silver in 2016 Climbed 15%. Here's Why. The precious metal climbed but fell back from its best levels of the year. Find out more about what happened. The price of silver rebounded in 2016 from where it began the year, with prices in New York trading climbing more than $2 per ounce to close the year at $15.88. That was a nice move upward in a market that has seen a lot of turmoil in recent years, but even the gain of roughly 15% in the iShares Silver Trust (NYSEMKT:SLV) didn't do much to claw back losses that took the silver market down from nearly $50 per ounce at its highest levels. Moreover, there are still some challenges that could produce further problems for silver in 2017. Below, we'll take a look at how silver performed in 2016 and why there's a lot of uncertainty about its prospects for the future. What moved the price of silver in 2016? Silver's gains in 2016 came mainly in two large upward movements, followed by a substantial pullback into the end of the year. During the first four months of 2016, silver climbed from below $14 per ounce to above $18, and most market participants pointed to choppy markets and a general improving sentiment in industrial commodities as the reason for the upward move. In January and early February, the stock market fell as oil prices dropped below $30 per barrel and the Chinese stock market showed signs of froth, culminating in a bear market for Chinese stocks that sent some investors toward precious metals as a safety play. Also supporting silver prices was the fact that anticipated interest rate increases from the Federal Reserve didn't end up happening as expected. After a December 2015 rate hike, no further increases in short-term rates happened until the last month of 2016, and markets early in the year celebrated the fact that lower rates would make it easier to hold precious metals positions. That loose monetary policy stance only got clearer after the U.K. vote to leave the European Union, as the fallout from the so-called Brexit decision added turmoil in the currency markets and made silver look more attractive as a store of value. Eventually, silver prices climbed above the $20 per ounce mark, a vital psychological level that some believed would spur even greater gains for the remainder of the year. Some analysts predicted $25 or more for silver by time 2017 rolled around. What happened to silver's big bull rally? However, $20 silver didn't last too long. By the end of 2016, silver had fallen back below $16 per ounce. That marked a decent gain for the year, but just a shadow of the roughly 50% rise that silver had seen at its best points during 2016. Perhaps the biggest contributing factor to silver's decline was that strength in the U.S. economy spurred confidence in other parts of the financial markets. For instance, after a quick two-day drop following the Brexit decision, the U.S. stock market regained its losses and climbed toward new all-time record highs, eventually culminating in the Dow's run to nearly 20,000. Moreover, the fact that economic readings were strengthening led investors to believe that long-awaited Fed rate hikes would finally happen, putting a pause on silver's gains. That downward trend only accelerated after the U.S. presidential election. After a momentary panic at the surprise result, investors quickly got their confidence back, sending stocks soaring and safe-haven investments like silver falling. Finally, silver's gains likely spurred some shifting of assets within the sector. Higher prices typically boost scrap supplies of the metal, and weaker industrial demand combined with investors looking to take profits from a successful year sent silver prices downward. 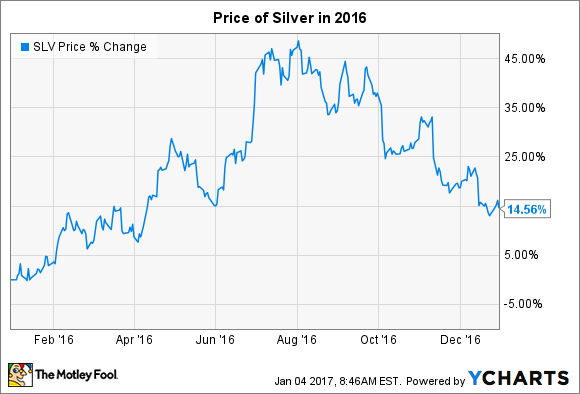 What's ahead for silver in 2017? Silver faces some challenges in 2017. Market participants who pay attention to technical factors won't like the metal's recent price action, and a bullish sentiment in most financial markets isn't adding much impetus to buying silver. Higher rates could also spur alternative investments away from precious metals. That said, there's a lot of uncertainty that could support silver prices in 2017. If big surprises emerge on the geopolitical or macroeconomic fronts, then silver could regain its upward momentum and climb back toward $20 in the coming year.